Ford had a big tech day Tuesday, with three driver-assisting announcements and a fourth related to cutting the driver out of the equation altogether. Potentially the most disruptive to collision repairers in the near term will be Ford’s expansion of its “Pre-Collision Assist,” which can alert the driver to an obstacle and ultimately hit the brakes automatically to prevent a crash in case the driver is incapacitated or still oblivious. The system will appear on a “Ford-brand vehicle” — a hint at a subsidiary like Lincoln? — in 2016, according to Ford, and be an option for most Ford vehicles around the world in 2019. The technology, which can detect both other cars and pedestrians and also help drivers apply the brakes, already is an option for the Ford Mondeo in Europe. Companies like Thatcham and Progressive have already reported similar systems have cut crash volume, though repairs can be higher if the car’s sensors are damaged in a crash. But Progressive notably is doing better on loss ratios because of collision detection systems, which indicates overall repair bills are lower and repairers wouldn’t do as much business. Ford named Randy Visintainer, director of global product development quality and system, the new director of autonomous vehicle development and gave him a global team to work such cars, SUVs and trucks. Ford said the advanced engineering work was Phase II of three phases needed to start selling a product. 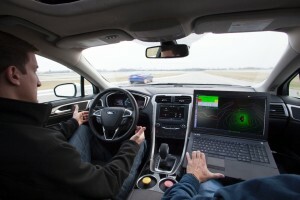 “The team now is working to make the required sensing and computing technology feasible for production and continuing testing and refinement of algorithms,” Ford said in a news release. The self-driving car team will draw from Ford’s existing driver-assist technology, including the anti-collision system. Ford bragged Tuesday that an SBD North America analysis found it offered the most driver-assistance systems in the large light-duty (F-150), midsize-SUV (Edge and Explorer), midsize-car (Fusion) and large-car (Taurus) segments, with eight examples of the technology on each of these models. SBD also found Ford offered the most vehicles with blind-spot checking, rear traffic alerts, lane-keeping aids and park assist (see more on that technology here and here), according to the OEM. Ford also Tuesday offered more details about its “split-view camera feature” available on the 2015 Ford Edge and some Ford Explorers. 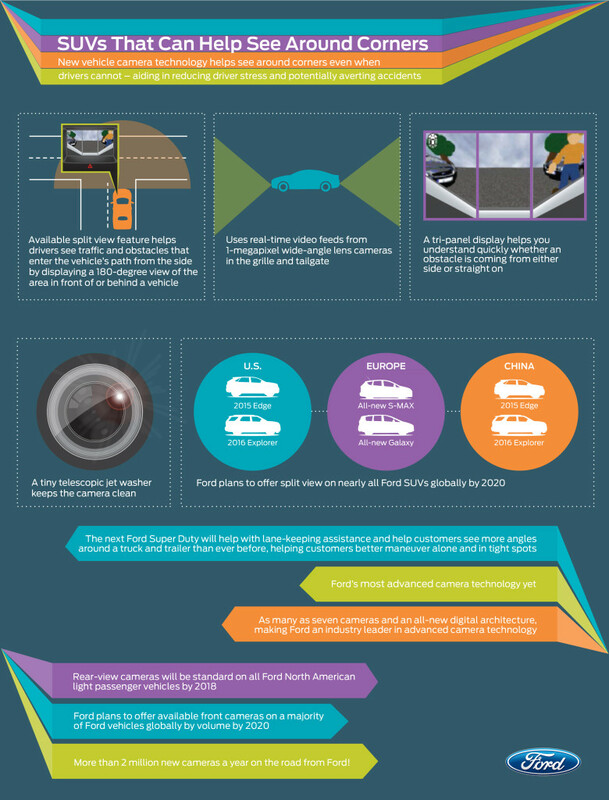 The systems help drivers see cross traffic both in front of and behind the cars with 1-megapixel cameras in the tailgate and grille that output images to a display. It doesn’t start automatically — you have to hit a button — but it does shut off on its own at 6.2 mph. The Edge has front split view, and both front and rear split view is standard on the 2016 Explorer Limited and Platinum. By 2020, according to Ford, nearly all of the company’s SUVs will be able to have the technology. One interesting feature which could help combat the concern that self-driving car sensors will be obscured by mud: The split-view cameras are cleaned by a jet washer. Ford also said Tuesday that the next Super Duty will has as many as seven cameras, two more than the 2016 F-150, which at five would still be more than anything Ford has now. Finally, Ford on Tuesday reiterated that Pro Trailer Backup Assist would be among the new features on the the 2016 Ford F-150 (and one of the cameras). It announced the technology back in May, but it’s just so cool we thought we’d run Ford’s video again.